Russian military forces opened fire on three Ukrainian ships off the coast of Crimea, rammed one of them, and seized all three. The ships were manned by 23 crew members. Ukrainian authorities say between three and six have been injured. Russia claims the boats had illegally entered its sovereign waters. However, what we do know is that the Ukrainian vessels - two gunboats and a tugboat - were sailing from Odessa around the Crimean Peninsula in the Black Sea, headed toward the Kerch Strait and Mariupol on the north bank of the Sea of Azov. A 2003 treaty between Ukraine and Russia guarantees both nations the right to use the Kerch Strait and Azov Sea for commercial purposes. The same treaty allows either nation to use the waters to transport military vessels so long as the transporting nation notifies the other. A Russian oil tanker nonetheless blocked the ships from passing through the strait, fighter jets passed overhead as if the ships were an invading force, and Russian troops boarded and took control of the ships. Ukrainian President Petro Poroshenko warned Tuesday of a "full-scale war," a day after he claimed to "have serious grounds to believe Russia is ready to follow with a ground attack." Also, on Tuesday, the Russian Defense Ministry announced that it had "begun testing the readiness of formations and military units of the Southern Military District," a region that includes the disputed Crimea and borders parts of Ukraine. Military trucks were spotted transporting the 3K60 Bal coastal defense missile system toward Crimea. On March 2014, Moscow annexed the Crimean Peninsula under the pretense of protecting a pro-Russian minority. Russia now considers Crimea part of Russia, although Ukraine and others holds it to be an illegal annexation. More than 10,000 have died in the conflict. The fighting goes on despite the Minsk II ceasefire signed in February 2015. 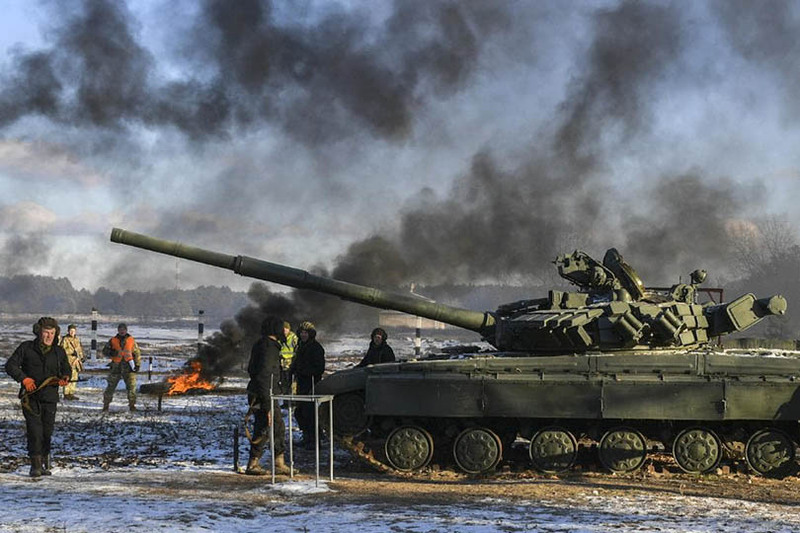 Ukraine has responded to this quiet invasion by increasing its military preparedness. The eastern European nation has doubled the size of its military in just four years: It now has around 250,000 active-duty soldiers and roughly 80,000 reservists. They are also better equipped. In 2017 the Trump administration began the sale of lethal defensive weapons to Ukraine. This means that at any moment Crimea and eastern Ukraine could explode into a large-scale hot war between proxies of the United States and Russia. Vladimir Putin wants to consolidate his gains in Ukraine and has every reason to precipitate a low-level crisis in order to find out how far America is ready to go. How did the United States respond to Black Sea incident? U.N. ambassador Nikki Haley issued a robust criticism of Russia’s aggression. But she’s leaving the administration. Secretary of State Mike Pompeo’s condemnation included forceful language but lacked any specific promise of consequences. However, Putin isn’t taking chances. Russia has announced plans to deploy more of its advanced S-400 surface-to-air missile systems to Crimea. “A division size of Russia’s S-400 Triumph air defense system has undergone tests and will soon be put on combat duty in Crimea,” the Southern Military District’s press service said on Wednesday. The personnel of the air defense missile unit of the 4th army of the Air Force and the Southern Military District deployed to Crimea has started preparing the equipment to be transported by rail to a permanent base. "In the near future, the new system will enter combat duty to defend Russia’s airspace, replacing the previous air defense system," the spokesman explained. Adding to tensions, Reuters has further reported that a Russian warship has been dispatched to the Sea of Azov. But this skirmish impacts NATO because Russia has made a habit of initiating challenging actions against NATO nations. In May of this year several Russian Navy (and probably Air Force) jets, including Su-30SM Flanker derivative and Su-24 Fencer jets flew in the vicinity of British HMS Duncan, which was 30 nautical miles from the Crimea. On Thursday last week, the Belgian Navy command ship Godetia was participating in a minesweeping mission, when it was surprised by the low-level flyover of two Russian Su-24s in the Baltic Sea. A Belgian frigate (F931 Louise-Marie) operating in the same area had to temporarily suspend an Air Defense exercise and keep an eye on the Su-24 “threat” to the other Belgian vessel. At the same time, NATO nations are supporting the Ukraine. Earlier this year, the Defense Department approved a $200 million military aid package to Ukrainian forces, bringing the total amount of American weapons and equipment sent to support Kiev’s fight against Russian-backed separatists in the country to $1 billion. The military support package will include new “capabilities to enhance Ukraine’s command and control, situational awareness systems, secure communications, military mobility, night vision, and military medical treatment,” according to a Pentagon statement. Pentagon officials have also agreed to provide “cooperation funds for additional training, equipment and advisory efforts to build the defensive capacity of Ukraine’s forces,” as part of the effort, the statement says. The Trump administration also told Congress that it plans to sell Ukraine 210 anti-tank missiles to help it defend its territory from Russia. Just two months ago on Sept. 27, the U.S. Coast Guard signed off on providing two patrol boats to Ukraine within the next year. And on Nov. 21, Britain announced it would provide Ukraine even more troops than promised back in September. That’s not all. Russia’s Izvestia newspaper reported that Kiev had been trying to persuade Washington - so far unsuccessfully - to open a military base in Ukraine.” However, Reuters, noted it could not be independently confirmed. The reality is that the Ukraine needs NATO assistance in any confrontation with Russia. The Ukrainian armed forces, which were placed on high alert Monday, were composed of about 250,000 personnel, including about 204,000 troops, according to the Ukrainian Defense Ministry, a figure dwarfed by 1.9 million Russian military personnel, a 2018 estimate that includes some 1,013,628 servicemen. Russian military expenditures also topped off in 2017 at $66.3 billion as compared to Ukraine's $3.6 billion, according to the Stockholm International Peace Research Institute. Russia also commands the world's largest tank army with some 20,000 armored vehicles and the Ukrainian government claimed last year that the number of Russian tanks covertly operating in support of rebels in Ukraine alone numbered some 680, a figure that would outrank the tank forces of the United Kingdom and Germany combined. As for the Ukrainian navy, much of its ships were lost when Russia gained control of Crimea and three more have been seized in Sunday's incident. Though Russia lost its sole aircraft carrier in a floating drydock incident late last month, the Black Sea Fleet has dozens of warships and the navy was set to receive 26 more vessels by the end of this year. Commentator Michael Bociurkiw argued Wednesday in a CNN op-ed that Ukraine was "woefully unprepared to wage a fight with Russia at sea" and that a Russian amphibious assault on the Azov coastline "would face little opposition." Dozens of Ukrainian aircraft were also taken in the annexation of Crimea. Even in Ukrainian hands, however, many of these planes were deemed unable to fly. David Axe of the War Is Boring blog writing in April 2014 that "16 Su-27s, 24 MiG-29s, 35 Su-24s and 24 Su-25s were flight worthy at the time of the Russian annexation" a month earlier and that "just 15 percent of the air force’s planes were combat-ready," citing a local survey. A more recent assessment authored by Mykola Bielieskov last month found that—following a deadly Su-27UB1M crash involving a Ukrainian pilot and a U.S. pilot—"the Ukrainian Air Force is left with seventeen Su-27s, in addition to twenty-one MiG-29 Fulcrums, a tactical fighter comparable to the F-16." He added: "It also can muster thirteen Su-25 Frogfoot ground-attack jets, a dozen Su-24 supersonic bombers, and forty-six L-39 jet trainers which can serve in the light attack role." It also has several heavy transport planes, reconnaissance aircraft and helicopters. The Defense Intelligence Agency's 2017 Russia Military Power report detailed the country's air power as comprising of a vast array of equipment including 141 bombers, 420 fighters, 345 fighter ground-attack aircraft, 215 attack jets, 32 electronic intelligence aircraft, 22 airborne warning and control aircraft, 6 command and control aircraft, 15 tankers, 122 heavy transport planes and 198 trainers. More modernized aircraft have begun entering service as of this year. Although the Ukraine is friendly with most NATO nations, without NATO membership, the Western military alliance has no obligation to intervene on Ukraine's behalf, potentially leaving the nation to face Russia on its own. However, NATO support of the Ukraine doesn’t mean Russia will lose any military engagement with the West. NATO forces in Eastern Europe are just a fraction of what Russia can field. Not only will they outnumbered, it will be difficult to reinforce them should hostilities break out against Russia and NATO. This is where the G-20 meeting in Argentina and the possibility of a meeting between Trump and Putin becomes important. Putin is paying close attention to how Trump and the US reacts. If Trump meets Putin and acts like nothing is happening, expect Putin to push the Ukraine harder. The deployment of a destroyer or frigate to the Black Sea may make Putin more circumspect in his action. However, a couple of American Navy ships in the Black Sea can do little in a military confrontation, because they would be seriously outnumbered. A more important move would be to deploy US Army units to Ukraine for “training” and maneuvers. Although these can’t stop Russia, they will act as a “trip wire” that Russia may not want to cross. NATO can also move ground units to Eastern NATO nations that could be moved to the Ukraine in a crisis. He clearly made the case that aggressive US punitive measures against its rivals is undermining confidence in the dollar. Putin also reminded Trump that Europe might not be willing to push Russia over the Crimea by noting that sanctions against Russia would lead to the loss of 400,000 jobs in Europe. Any NATO action might threaten natural gas supplies as Europe heads into winter. In the end, it is more likely that the current situation will calm down. However, it’s not guaranteed that calmer heads will prevail. We have only to look at World War One a century ago to realize that it’s quite possible for rational politicians to march the world into a major war.